Free Shipping Included! Mariana Silk Guardian Angel Style Tennis Bracelet, Silver Plated, 8'' 4501/1 1049 by Mariana at Femi Store. MPN: B-4501_1 1049 SP. Hurry! Limited time offer. Offer valid only while supplies last. About Mariana: The artist and jewelery designer, Mariana has been creating unique and original exotic pieces of fashion jewellery since 1997. Beautiful Mariana statement bracelet, style B-4501/1. Round tennis bracelet, hand set with 11 faceted, round cut Swarovski Crystals. Decorated with guardian angel style flower accents, and 4 layer roundels. 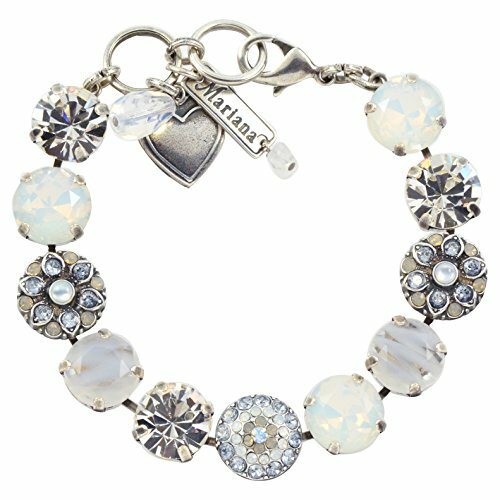 Includes 3 charms: polished heart, small Swarovski drop, and Mariana branded tag. Bracelet is 8 inches long with a ring extender and a large lobster claw clasp. Silver plated with .925 sterling silver over brass. If you have any questions about this product by Mariana, contact us by completing and submitting the form below. If you are looking for a specif part number, please include it with your message.